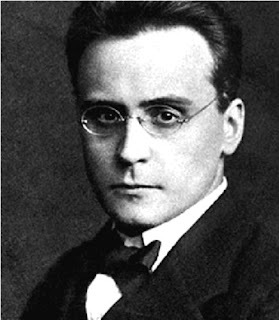 It is one hundred years since the Austrian composer Anton Webern composed his String Quartet Opus 5. Webern has a reputation of being the writer of some of the most intensely concentrated music ever written. The French composer and conductor Pierre Boulez has compared Webern's music to Japanese haiku poems. The String Quartet was the first milestone in this remarkable development. Webern's complete works fit onto three CDs. The second movement of his Opus 5 is just thirteen bars long. The whole five-movement quartet takes five minutes to play. When you reach this level of concentration, every note counts. Nothing is superfluous. There is no "padding". It is remarkable to realize that this music is already one hundred years old. It seems much more recent. Webern was so far ahead of his time. His Opus 5 predates Stravinsky's Rite of Spring (1913) and were written around the same time as Gustav Mahler was writing his last works. Webern died tragically in 1945. He created a body of work that remains unsurpassed in its concentration, intensity and musical beauty. The nuts he left are not easy to crack, but take the time to explore his music, and the rewards are fulsome.